Steve and Joan Bromley and their team of 15 pride themselves on quality workmanship and good-old fashioned honest service – they’re so dedicated to their clients they are available 24/7 to provide solutions for emergencies. Their philosophy is to provide farmers a choice in product and solutions, and offering that choice is a big focus for the team. 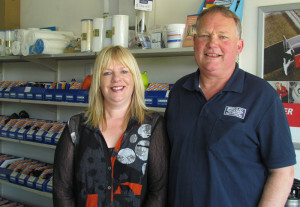 Steve and Joan established Bromley Dairy and Pumps after realising the wider Manawatu was under-serviced, an observation that prompted them to form Bromley Dairy and Pumps in 2001. In 2002 they moved into their purpose built business premises at 6 Weld Street, Feilding. They say their Feilding base is ideal; it’s a rural town and centrally located to allow efficient service for their customer base. The Bromley team proudly offer more than just a retail relationship to their customers – it is a one stop shop for on-farm engineering, Effluent & water reticulation and milking system needs.